I’ve been wanting to make a cider punch for the holidays but I didn’t want an entire punch at my house. There’s over 3 cups of bourbon in this one! I found the perfect opportunity to try it out at a white elephant party that was scheduled for December 2nd. 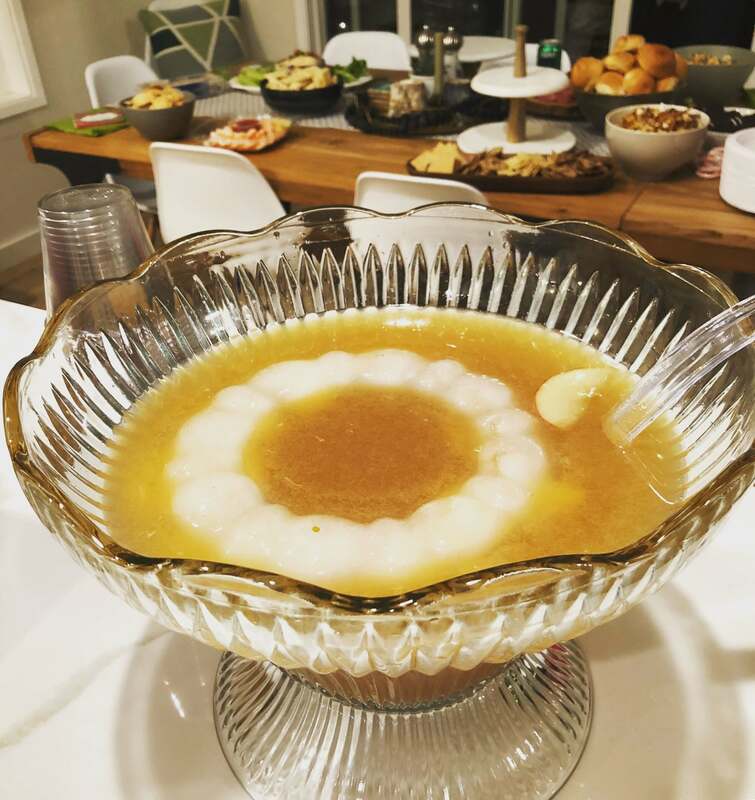 I toted my heavy punch bowl over to the party, all the ingredients in sealed containers and a bundt-pan ice ring on the side. 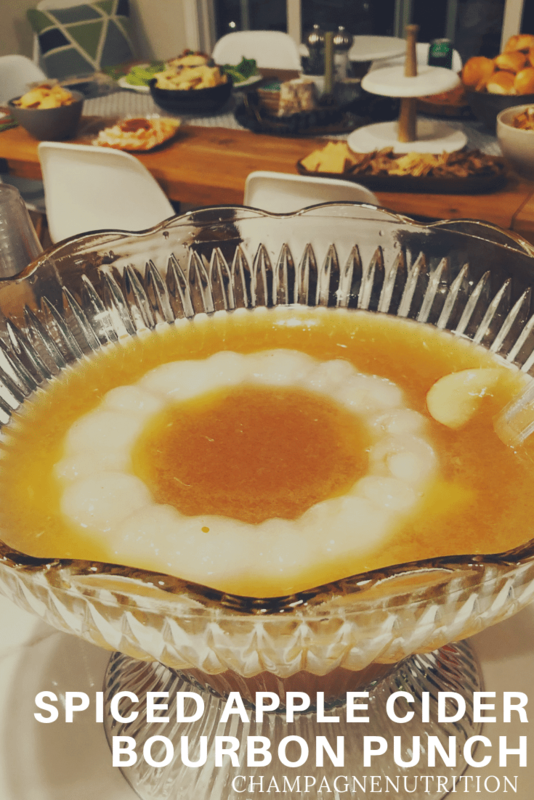 As soon as I assembled this Spiced Apple Cider Bourbon Punch, people were swarming it. I overheard folks saying, “did you get any of that awesome punch?” and they kept going back for seconds. This time of year is always insane. Each year I try to figure out how to make December more enjoyable despite the chaos. One thing that works well is batching all tasks. Like shopping early; I have my list and I try to knock it out all in one day. Then I wrap all at once. I do Christmas cards all at once. I bake all at once. That kind of thing. I schedule in workouts for the whole month so I have that commitment. I plan my menus ahead weekly so I’ve got food – aside from the cookies and candy that seem to be everywhere I turn. I also try to pick recipes that are quick and easy – make-ahead capability is a huge bonus. For my Spiced Apple Cider Bourbon Punch, you actually have to make it ahead. Even the day before is great. You boil the cider, cinnamon, nutmeg and apples which creates a balanced, flavorful base but after you add the honey, you set it aside in the fridge for at least 3 hours. That gives you time to batch a couple other tasks and still look like a pro at making holiday punch! I’d love to hear how you bring sanity to the season! And if you need more healthy holiday cocktails, try my Gin Ginger Beet Cocktail or my Orange CranPom Sparkling Punch with Thyme. Pour hot water into a bundt pan and add apple rings (cut in half if needed to make them fit). Place in the freezer for 3-5 hours until completely frozen. If you don't use the entire apple, save some of the rings.